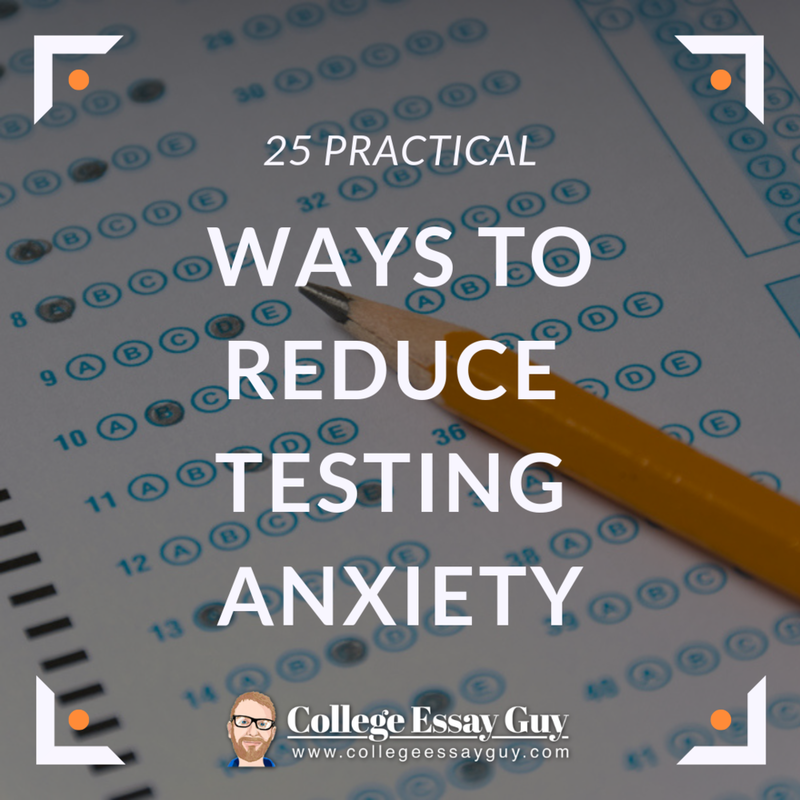 Check out the podcast: where Ethan interviews Jed Applerouth, the author of this post, and outlines each of the 25 ways to reduce testing anxiety one at a time. Why are we talking about anxiety in the first place? The 2014 National College Health Assessment found that 54% of all college students report feeling overwhelming anxiety, up from 46.4% in 2012. Test anxiety is becoming increasingly common: Research reveals an increasing trend in test anxiety over time, potentially as a result of the increase in testing and testing requirements in U.S. schools. Test anxiety is more prevalent in later grades. Students with disabilities, gifted students, and females tend to experience higher rates of test anxiety. Test anxiety contributes to the gender gap in mathematics on tests like the SAT (Anxiety, Stress, & Coping (2011). University of Florida research). Test anxiety can affect performance, squeeze out cognitive capacity, overwhelm working memory, and create a cascade of physical symptoms. Potential confounding factors include processing speed deficits, skill deficits, learning differences. Normalize test anxiety: Share with your student that test anxiety is remarkably common, that over 60% of students report experiencing test anxiety at some point, and over 25% report experiencing it regularly. Identify the source of the anxiety: In many cases students are internalizing anxiety from an outside source and making it their own. Sometimes parental anxiety can manifest as student anxiety. In cases such as these it can be helpful for parents to remove some of their attention from the testing process and outcomes by hovering less and giving the student more space. Taking external pressure off of the student can help decrease the student’s anxiety. Learn a little about your biology and neurochemistry: Students who understand how anxiety functions in the brain and in the body will have an edge on self-regulation. Students should understand the amygdala’s primary function, how it spots threats and activates stress hormones to rally the body’s defenses. Students who understand how stress hormones affect the body and mind will be able to quickly identify the earliest signs of anxiety and begin to use interventions to regain their center. Draw from other domains of competence: Students should adopt a strengths-based approach, examining other areas of their life where they’ve been able to effectively regulate anxiety and stress. What works for you that you can borrow and bring to testing? How do you manage stress before a sporting event or performance? What techniques already work for you? Let’s import those and put them to work. Accentuate self-care: How do you nurture and take care of yourself? We all have things that make us feel good and relaxed, whether it’s a warm bath, a favorite meal, soothing music, playing with a pet, or talking with a supportive ally. Do things that help you center yourself and calm your mind. Write about your test anxiety: Researchers have found that taking 10 minutes to write expressively about your anxiety and how it affects you can help reduce test anxiety and boost performance on tests. Reappraise your arousal: Reframe the physical symptoms in a more positive light: Researchers have found that telling students that physiological responses often associated with anxious reactions (e.g. sweaty palms, rapid heartbeat) are beneficial for thinking and reasoning can significantly improve performance on high stakes tests! Don’t sweat the sweaty palms: a little boost in cortisol and norepinephrine can help you focus and do better when it counts. Build upon small successes: The key to building your competency beliefs and creating future success is to have mastery experiences. Example: "If you can master these five problems, we can build on that and move on to the next problem set." When a student achieves mastery over a limited set of problems/challenges, it’s essential to focus the student’s attention on what specifically he/she did in order to achieve the mastery result. Focus on your actions and behaviors and the connection between those behaviors and positive outcomes. You can build upon your smaller successes to enable the greater ones. Focus on your self-talk and inner dialogue: Anxiety is sustained by inner dialogue. Our self-messaging is fundamental. When your inner critic is serving up a plate of harsh self-criticisms, consider this as simply another mental activity for you to notice, rather than as something fundamental about you. You can label these critical thoughts “judging, judging” or “doubting, doubting.” Or you can directly counter and challenge the inner critic. “Hey, play nice.” Never let negative self-talk run unchecked. Correct maladaptive self-talk: Be very careful about reinforcing negative self-beliefs. Don’t run around telling people, “I’m bad at test taking.” If you reinforce that message, something inside is listening, taking note. That thought can eventually become a thing, an obstacle, that will affect how hard you try when you encounter a challenging problem or test-section. Never make global, self-limiting statements to yourself or to others. Practice self-kindness and compassion with your self-talk. Use “You-Statements” to bolster confidence: Build yourself up on the inside by making supportive second-person “You” statements. Researchers have discovered the efficacy of “you” statements over “I” statements. Coach yourself: “Sam, you can do this, you’ve got this, you’ve studied hard for this.” Establishing the cognitive distance, the separation between your little ego and your supportive external voice. It makes a difference. Externalize the Anxiety Monster: If your critical/anxious voice is running wild on the inside, it may help to personify the negativity and give it a form, give it a name. “Oh, Worry Beast, there you are again. I knew you were going to show up here!” “Murray, you worry wart, of course you want to get into the action and show up during my ACT. But you need to leave for a while. We can talk later.” By naming the monster, you can help tame the monster. Creating some cognitive distance from the anxious thoughts allows you to achieve a measure of control over them. Imagined practice makes perfect: If you have had many experiences of anxiety during tests, it may help to visualize yourself taking a test without suffering the effects of anxiety. It’s a practice known as cognitive rehearsal, or guided imagery, taking a mental walk-through in advance of a performance event. Athletes do it all the time, imagining themselves performing at their peak level, in advance of the high-stakes event. Imagine yourself walking through the test, missing problems and staying calm and centered: Lay down a new template of you as a peak-tester, and make the images as vivid and sensorily rich as possible, so your mind believes them. Imagined practice can be as powerful as actual practice. Regulate your breathing: Deep diaphragmatic breathing is a powerful anxiety-reducing technique because it activates the body’s relaxation response. Breathing from the diaphragm, in a slow measured way, filling the stomach then the chest, stimulates the vagus nerve, which controls the parasympathetic (calming) nervous system. Stimulating the vagus nerve leads to a decrease in heart rate, blood pressure and other sympathetic responses. Practice breathing deeply and consciously, multiple times per day, and this technique will be available to you on test day. Imagine you are breathing into your heart center: There’s a simple technique I use when I’m nervous, where I place my hand over my heart, and take deep breaths, focusing my energy on my heart. This is a technique I learned from an organization called Heartmath. The act of combining slow breathing, a nurturing gesture, and redirecting my consciousness to my heart, helps restore a sense of calm. This is a simple technique to employ for a few breaths during a test. Use the body to help ground anxiety: Exercise is a natural anxiety reliever. Research shows that as little as 30 minutes of exercise three to five times a week can provide significant anxiety relief. Exercise is protective in that it boosts endorphins and neurotransmitters such as dopamine and serotonin, which may reduce symptoms of depression and elevate mood; it also suppresses the release of the stress hormone cortisol. Use holistic relaxation: You can help lower anxiety by learning to relax your body. One technique involves progressive muscle relaxation. Tire each muscle, tensing it as hard as possible for up to 10 seconds before releasing and letting it rest. Progress from your right foot to your left all the way up the body, one muscle at a time. You will relax your body, and your mind will follow. Get enough sleep: Sleep is key to reducing anxiety. Sleep helps to heal the brain, clean out toxins and waste products, process memories and regulate emotions. You may notice that you are edgier when you are sleep-deprived. If you focus on healthy sleep hygiene, this can help reduce anxiety. Be sure to get a restful night sleep the Thursday and Friday preceding a test day. Eight hours a night is optimal. Attend to your body’s posture: Your body’s posture affects anxiety! The brain is listening to the body, so be attentive to the physical state of your body. If you furrow your brow, frown, and clench your fists, your external physical form can affect your inner state. Likewise a relaxed, open posture can affect your inner emotional state. Practice sitting in a relaxed, calm, open manner to create that same inner landscape. Try tapping: One technique that has worked for some students is called tapping or the Emotional Freedom Technique. This is a super simple process, involve tapping a series of points on your body in a particular sequence: 1. Eyebrow 2. Side of eye 3. Under eye 4. Under nose 5. Chin 6. Collarbone 7. Under arm 8. Top of head. Tapping somehow has an effect in anxiety reduction and has been shown to help people with PTSD and anxiety disorders. It’s simple and free; it takes a few seconds and may be helpful. Ground yourself in nature: Getting out into nature can help lower levels of anxiety. A quick walk in the woods can change activation patterns in the brain and lower rumination and focus on negative emotions. Another study found that teenagers exposed to water fountain sounds at the dentist’s office experienced reductions in anxiety levels! Emotional regulation increases when we are more connected to nature. Ground yourself through human connections: Relationships and human connections can dampen your biological response to stress. Our human connections can stimulate the release of oxytocin, a hormone which helps regulate anxiety by decreasing our levels of cortisol, a stress hormone. Oxytocin appears to make the amygdala less reactive to fearful stimuli and may ultimately be used in treating anxiety disorders. Use centering mental images or wisdom figures: Carl Jung explored the grounding effects of accessing archetypal centering figures. When our little self is feeling scared and insecure, we can turn inwardly to a more developed aspect of our self, an inner spiritual or religious figure to help us to recenter and ground our anxiety. Evoking that centering energy within can help. Practice taking tests in conditions which replicate the test environment: Recreate, as best as possible, the anxiety-inducing condition during practice. If you are learning how to self-regulate your emotions and manage your anxiety, it’s important you practice your techniques in a public setting, rather than in the relative tranquility of your bedroom or home. If being in a big testing room stimulates anxiety, you must practice your tests in a similar condition. Mindfulness/meditation: This was our bonus strategy on the podcast. Meditation is all about self-regulation. Meditation can help you learn to calm yourself down and find your center, to learn to watch yourself from an observer’s perspective and learn how your mind responds to situations. If you practice meditation, and learn to observe your thoughts and reactions with composure, you will strengthen your self-regulation skills and be able to stay calm in a variety of conditions. So what should students do with all this? There are so many applications here, which apply to numerous areas of education and life. Self-regulation is essential. We will all face stressful situations in a great many contexts. The ability to self-regulate one’s emotional state is a gift that keeps on giving. Students can learn to take self-regulation strategies from one area of life and see if they can apply them to other areas. Get creative. Find out what works. Practice and get better and better at bringing yourself back to calm, to optimize performance and happiness. Jed Applerouth is the founder and CEO of Applerouth Tutoring Services, an education services company with offices in major metropolitan areas across the country. A graduate of the University of Pennsylvania and Georgia State University, Jed is a Nationally Certified Counselor with a PhD in Educational Psychology. A published educational researcher, Jed has investigated facets of student cognition, memory, motivation, and learning strategies to enhance the pedagogy of his team of educators. Since 2001 Jed has lectured extensively across the country at national conferences and high schools on topics ranging from test test anxiety to academic motivation. Outside of work, Jed is an avid landscape painter and photographer and serves on the board of the therapeutic STAR foundation. WANT SOME HELP NAILING YOUR PERSONAL STATEMENT? CHECK OUT MY COURSE BELOW! Our guest blogger Ted Dorsey received a perfect score on the PSAT, ACT, and SAT. He is founder of Tutor Ted and author of numerous ACT and SAT test prep books. Check out his free ACT intro course here and his comprehensive online ACT prep course here, which includes over eight hours of video lessons and over a hundred sample questions, including all of the knowledge and strategies Ted shares with his private tutoring students in Los Angeles. How should you choose between the SAT and ACT today? Ah, 2016—it was such an easy year to answer this question! Back in the good ol’ days of 2016, things were simpler. Unless you were freakin’ crazy, you took the ACT. For good reason! ACT had a clearly established test format and score curve, 10x as many practice tests, and proven methods to improve scores. Game, set, match. ACT has made changes to the format of its test*—at times without any advanced warning. Once the January 2017 test is available, SAT will have doubled the number of available official practice tests. That number of tests available is still just eight, so we’re well short of the 60+ available practice ACTs. But it’s progress. All the recent ACT prep has caused ACT scores to become really, really good. That last one is a double-edged sword. At first read, you might think, “I am DEFINITELY going to take the ACT if I can get to a 33 or better with test prep!” If that’s true—which it is for a growing number of students**—you could land yourself an exceptionally high ACT score through some thoughtful prep. And that’s great news! But here is the other edge of this particular double-edged sword: if everyone is getting a 33+ on the ACT, is your score really so exceptional? Let me put it this way: the point of getting a high score on these tests is to differentiate yourself from other college applicants. Now suppose you score a 33 or a 34 on the ACT. That’s an outstanding score! But if it only indicates that you are in a substantial pack of highly qualified applicants, has it helped get you in to college? That question has led to the idea of taking the SAT as a way of differentiating yourself at the top of the curve. The idea is that if you can get a killer score on the SAT, it may be more impressive than if you get a killer score on the ACT. So, let’s get back to the original question: how should you choose between the ACT and the SAT? Here are the five steps I would recommend to make your decision. #1: Take a practice ACT (like this one) in October of junior year—which is also when you’ll take the PSAT. #2: Ask yourself whether you preferred the format of one test or the other. #3: Compare the scores of those two tests using this website. Add 80 points to your PSAT score to convert it to an SAT score. #4: Use those last two factors to make a decision. In the case of a tie, choose the ACT. It’s still easier to improve your score on that test than the SAT. #5: If you’re a student already scoring in the 99+ percentile on these early tests, strongly consider prepping for the SAT. A great SAT score will help you differentiate yourself from the field of qualified students. Last thing: your choice of ACT or SAT is not a permanent one. You have the power to change your mind whenever you want. We strongly recommend you prep for one test at a time, but you can always then prep for the other test too. Whatever decision you make, be sure to prep enough that you feel comfortable and ready when you open the test on the big day. * Including more advanced content on the Math Test, such as statistics and probability, paired passages on the Reading Test, and, most recently, changing the parameters of the Writing Test such that students do not need to respond to all three given perspectives. ** I don’t have the data for all ACT-takers across the country, but it used to be that 1% of students earned a 33 or better on the composite score. In the past two years, at least 50% of our students have. We probably have a disproportionate number of smart students, but I think it’s also likely that the scoring standard at the high end of the ACT curve is still based on performance standards rather than a new percentile curve. Or the current students are being judged on an old percentile curve. Either way, a LOT of students are getting exceptionally high ACT scores. Check out his new comprehensive ACT course here, as well as his free ACT intro course here. When I first heard about the new ACT essay prompts last year, I was worried. As a former high school English teacher, I immediately knew students would struggle with the new format. It turns out I was right. A recent article in the Washington Post, “ACT essay scores are inexplicably low, causing uproar amongst college-bound students,” reveals the surprise and anguish of typically many high-achieving students who seem to have no idea why their scores on the new ACT essay (launched in September 2015) are so much lower than their multiple choice scores. There are a few factors at play here. For one, I think that students are shocked at now seeing their essay scores on the same 1 to 36 scale as their other section scores. On the previous essay, students received a score from 2 to 12, and many students didn’t take their scores too seriously. “8 out of 12, 9 out of 12. Whatever, that’s good enough,” was a common sentiment. But ACT test-takers tend to have stronger opinions about the scores they want on a 36 scale. Now that the essay and multiple choice scores are on the same scale; it’s easier to draw comparisons. However, it turns out that if you are unhappy with your ACT Writing score, you may actually not have done as “bad” as you thought. For example, a 26 on the ACT Writing test puts you in the 93rd percentile of test-takers, whereas a 26 composite score on the multiple choice sections puts you in the 83rd percentile. A 22 on the essay puts you in the 80th percentile, but a 22 composite score puts you in the 63rd percentile. So consider the percentiles over the score. But now let’s talk about the actual essay prompt and why I think it’s so challenging, particularly for students who haven’t been taught how to write it. The new ACT essay prompt asks students to do a lot, three things in fact, in a 40-minute time period. The old ACT essay asked students to do basically one thing: state an argument and support it. Most students can handle this. They’ve been taught how to write a thesis statement that states an argument and then how to write body paragraphs that develop supporting reasons for this argument. How do you structure an essay like this??? Here’s where I think students are getting into trouble: they are getting caught up in the first bullet point and fail to effectively answer the second, which is actually the most important as far as the ACT essay graders are concerned. The thing is, the ACT doesn’t want you to write an explanatory essay (or what your English teachers probably call an expository essay), they want you to write a persuasive one. But the prompt appears to be asking students to do BOTH: “explain” (the first bullet point) and “persuade” (the second bullet point). Personally, I think this is poor essay prompt planning on the ACT’s part, but it is what it is. See what’s happening here? Students are trying to summarize the three different perspectives into one statement, an admirable attempt, but according to the ACT graders, they don’t have an argument. So here’s my biggest piece of advice for success on the new ACT essay prompt: focus on the second bullet point. Craft a thesis statement that states your perspective on the issue. Then focus on analyzing the three perspectives in your (likely three) body paragraphs as they pertain to your argument. So if your argument disagrees with one of the perspectives, then analyze it in this light; if it agrees with it, then develop it in this sense. This also automatically checks off the third bullet point: to explain the relationship between your argument and the provided perspectives. Win! So remember, even though the new ACT essay prompt may look different, it’s still similar to the old essay prompt in one important respect: the graders cares most about your ability to make an argument, so make doing this your priority and the rest will follow. As Magoosh's resident ACT Expert, Kristin creates awesomely fun ACT lessons and practice materials for students. With a PhD from UC Irvine and degrees in Education and English, she’s been working in education since 2004 and has helped students prepare for standardized tests, as well as college and graduate school admissions, since 2007. She enjoys the agonizing bliss of marathon running, backpacking, hot yoga, and esoteric knowledge. 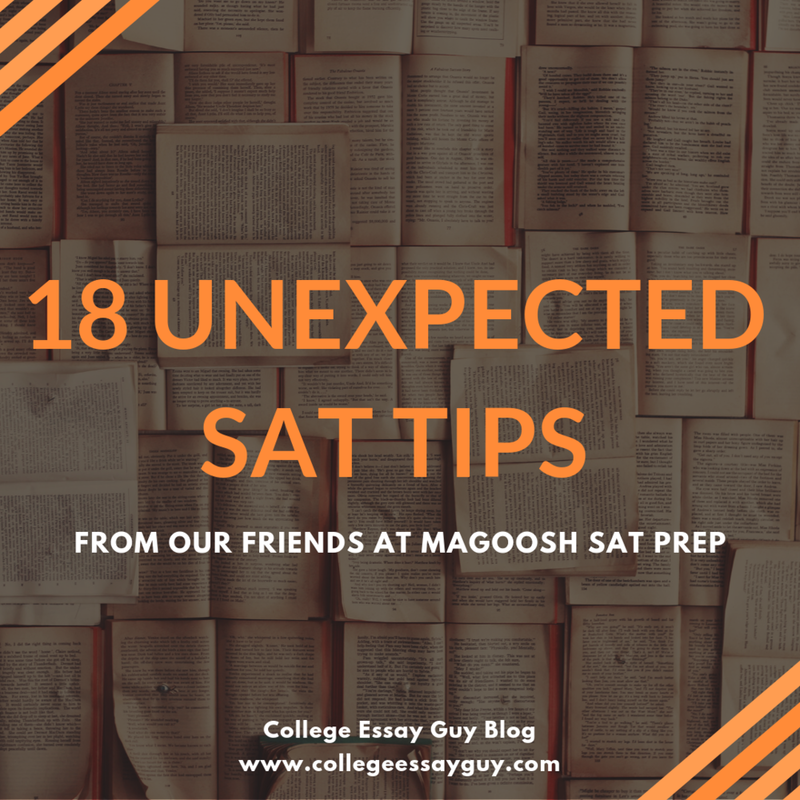 This post was written by Chris Lele, resident SAT expert at Magoosh, a leader in SAT Prep. For more SAT resources, check out Magoosh SAT vocabulary flashcards and the Magoosh SAT Blog! Imagine a massive tree, its diffuse branches stretching to the heavens. The tree’s green canopy of leaves is bedizened with luscious fruits, from the very lowest branch (you can reach out and pluck a fruit) to the highest (you’ll have to crook your neck just to spot them). But there is another special thing about this tree: each fruit is exactly the same; the ones that get the sun’s full warmth are no different in size, shape and flavor than the those shaded by branches looming overhead. The name of this tree? The SAT tree. 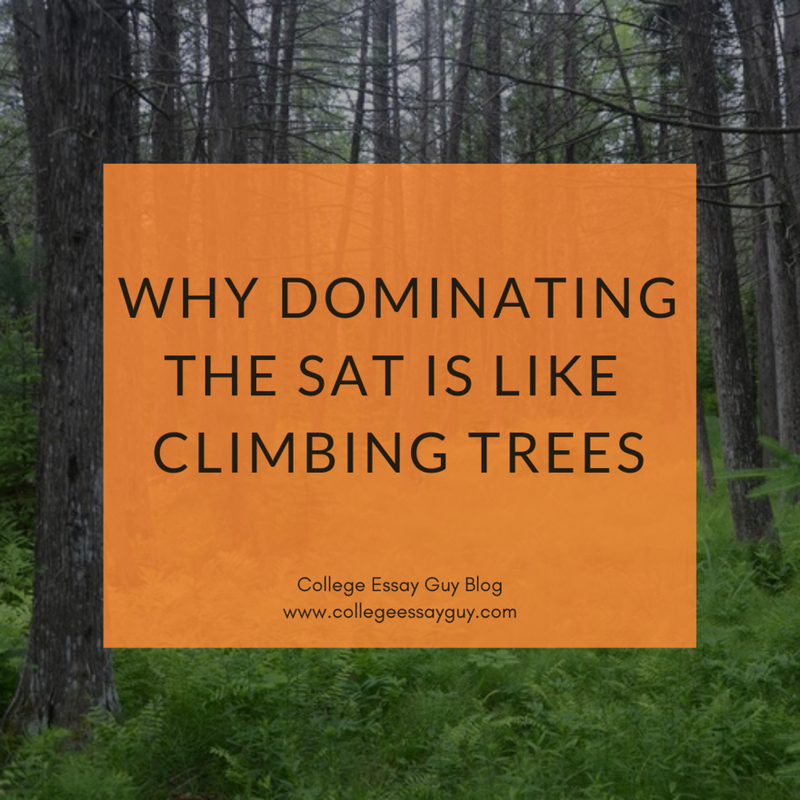 So how does the tree of SAT work? Well, clearly you’re not going to get any vitamin C from these fruits. But what you will get is the following: the same number of points. That’s right: the easiest question on the SAT is worth the same number of points as the hardest question. In other words, the fruit on the very lowest branch, the one you can basically just reach out and grab, is just as juicy, just as Vitamin C laden, as a fruit that will require you to scale eighty feet of sap ridden trunk, before you have to Spiderman your way to the edge of a creaking branch. So which one would you go for first? That’s right—that’s the exact mindset you want to bring the SAT. Do the easy questions first, leaving the hard ones only if you have time. (For other similar tips check out this SAT lifehacks infographic). You might be wondering how you know which question is easy and which one is hard. Well, for the most part the SAT has made it pretty easier for you. The higher the number within a given question type, the harder the question. The first Sentence Completion? That’s the fruit you can reach out and grab. The Sentence Completion with SAT vocabulary like pusillanimous, lugubrious, and byzantine? Well, that’s some spidey stuff for you. The only area in which you don’t know the difficulty of the question based on numbering is in the SAT Reading Comprehension section. So the first question you can get can be a mind-bender, a cakewalk, or anything in between. That said, you can get a sense of the general difficulty by looking at the passage. If it’s long and abstract, well think of it as a thorny tree, one that you should only return to once you’ve clambered up more arboreal-ly friendly terrain. This all sounds great in theory, but to really use this knowledge to your advantage you must apply it. Try a Critical Reading section in which you skip the last two Sentence Completions. Or, if it is the section with two medium passages, one that is notably more difficult than the other, do the easy one first. And remember that you don’t get extra points for finishing the test—so don’t just blitz through the tough passage and then bomb every question. Slow down, skip a couple of tough questions (based on if they seem tough), and do your best on the ones that you feel you can answer correctly. With enough practice, you should find become better at navigating the sections so that you are picking the low-hanging fruit before scaling up to the higher branches. And even if you try for the fruit at the very top, don’t worry. There’s one more special thing about this tree: you can’t fall off of it. CHECK OUT THE FREE TRIAL TO MY STEP-BY-STEP VIDEO COURSE HERE! You can’t avoid it. Every SAT prep checklist has it, and every SAT prep tutor will tell you to do it: STUDY! Yes, we all hate to have to do it, but it really is the key to your success on this (and every) standardized test. But, the fact is, even after you’ve studied all you can for the SAT, you’re not guaranteed success. You might have heard stories of a classmate who crumbled under the pressure of studying for the test, or who slept right through his alarm on the morning of the test, or who ran out of energy and collapsed right on top of her desk during the test. It really could happen to anyone! Before you panic about the chances of this happening to you, we’ve got good news! Our friends at Magoosh SAT put together an SAT lifehack infographic to make sure you safely avoid any test-day nightmares. The infographic includes study tools and tips you probably didn’t consider before but that are crucial to keeping you sane all the way up to your test date. So, take some time to browse this list of SAT prep lifehacks and master the 18 unexpected tips you’ll need for a higher SAT score! Ready to get started? Here are Five Tips for How to Outline Your SAT Essay.